Inviting 5 bedroom holiday home near St-Jean-de-Luz, Aquitaine. A wonderful holiday home for the whole family featuring a garden with private pool, ideal for kids to play and for parents to relax under the French sun. You’ll find yourself only a few minutes from the blissful Southern French beaches. Sleeps 10. 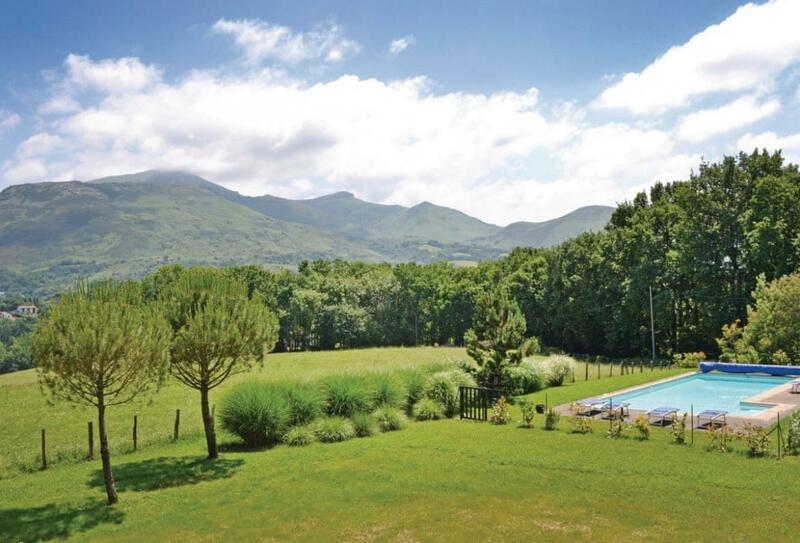 Superbly situated amidst delightful countryside and yet only 5 km from St. Jean-de-Luz and its sandy beach, this property has a superb view of ’La Rhune’- the last big peak of the Pyrénées. An old wooden train (3km) travels to the mountain summit (902 alt.) with breathtaking views of the peaks and the expanse of beaches of the Landes and the Basque country, stretching from Biarritz and St. Jean-de-Luz as far as Spain. Nearby is the lively village of Ascain with its Roman bridge and 16th-century church. This impressive property stands in a large enclosed garden with a small rear orchard, as well as a large swimming pool. The interior is delightfully furnished, and decorated with clever use of co-ordinating fabrics. The living room features a cosy open fire, home cinema system and French doors leading to the garden perfect for enjoying a glass of wine and admire the sublime views. Location: 3km E of Ascain (most facilities, tennis, swimming pool - summer only), 5km SE of St. Jean-de-Luz (all facilities, sandy beaches, watersports, tennis, golf), 20km SW of Biarritz (all facilities, casino, airport).